Monnalisa Couture Collection is an exclusive selection of special occasion dresses which would be perfect for high-class events. They feature innovative cutting and fabrication techniques that look absolutely mesmerizing. The collection is hand detailed with the finest embellishments featuring sequins, crystals, lace and beading, and each gown is created to meld classic elegance with sophisticated style. All dresses from this line feature sleek and classic silhouettes that are flattering and timeless. Exquisite pink and Ivory dress by Monnalisa Couture. Made in an embroidered floral, soft silk organza. In a sleeveless style with a wide neckline, fitted bodice and a tulle net layers underneath that give it a flared look. The waist is decorated with a detachable grosgrain ribbon embellished with diamanté, has floral appliqué on one side and ties in a bow at the back. The dress is fully lined with soft cotton fabric and fastens with a concealed zip at the back. An exquisite dress by Monnalisa Couture. 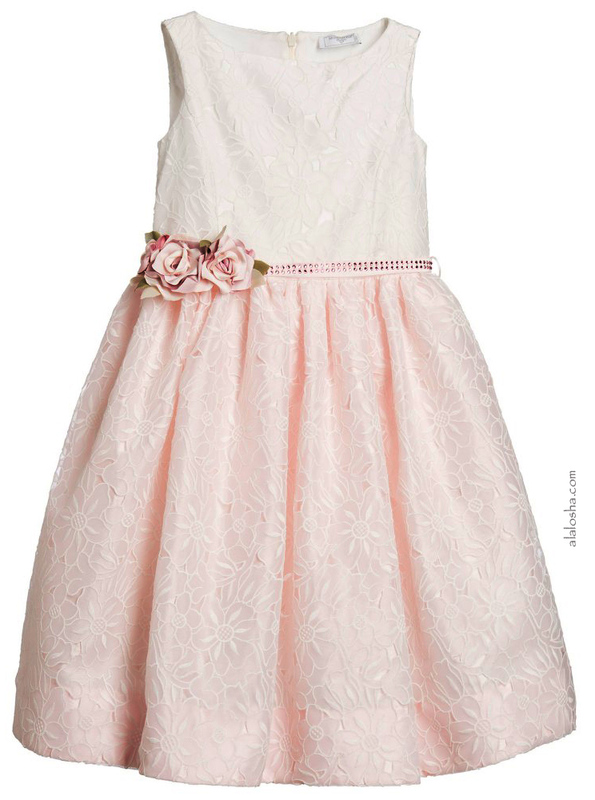 This sleeveless dress has a smooth cotton lining, a tulle underskirt and fastens with a concealed zip at the back. 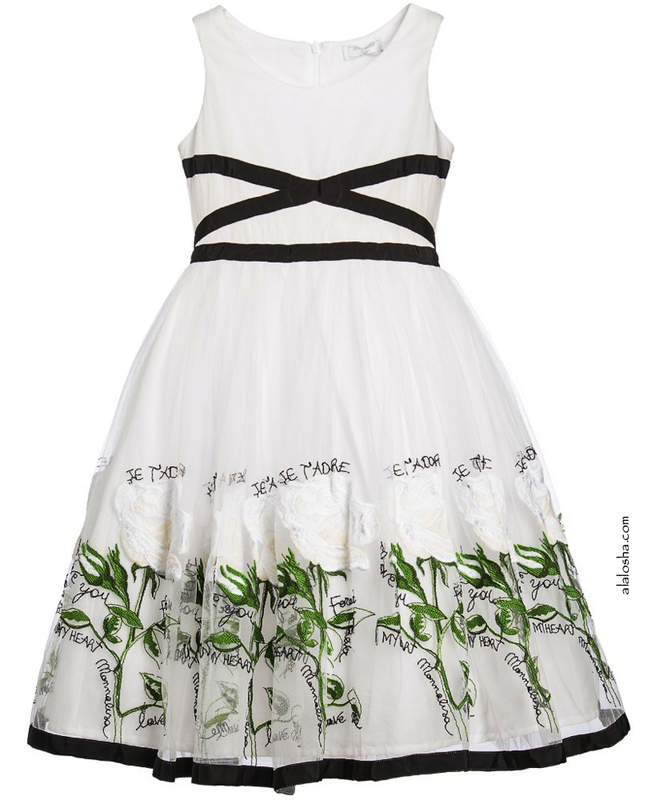 The outer soft tulle layer has a beautiful white rose embroidery with the designer's name and wordings such as ' I love you' and 'Forever in my heart'. It has a fitted bodice with black ribbon appliqué across the chest and round the waist. The skirt is gathered and full with stiff netting underneath and has a matching black trim on the hem. A stunning dress set by Monnalisa Couture. In soft shades of pink neoprene and cut on the bias, that gives the dress a distinctive flow and feel. It is crafted with lines of diamantés on the front and back with concealed zips on the side and diagonally on the shoulder. The loose, full petticoat is made from a smooth cotton jersey with amazingly soft and fluffy layers of tulle that add volume and flair to this beautiful dress, and can also be worn with other dresses, to add volume. The dress comes with a detachable rose brooch.